The What: SMART Technologies has released TeamWorks, its latest visual collaboration software that aims to enhance productivity, creativity, and innovation for team meetings—regardless of physical location or device. SMART launched TeamWorks to help teams start meetings quicker, easily collaborate in real time, share content between devices, and provide meeting recaps for more natural content interaction with in-room or remote participants. The What Else: The software features a one-touch meeting launch and wireless screen sharing—addressing common issues when hosting meetings, helping to utilize existing technology and include dispersed teams. 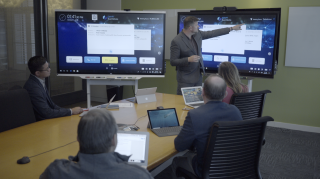 The Bottom Line: TeamWorks, when paired with a SMART interactive display, is a fully integrated collaboration solution that provides a holistic, simplified meeting room experience that caters to a full spectrum of needs, according to the company. TeamWorks is available now.